Soy milk or soymilk is a plant-based drink produced by soaking and grinding soybeans, boiling the mixture, and filtering out remaining particulates. It is a stable emulsion of oil, water, and protein. Its original form is a natural by-product of the manufacture of tofu. It became a common beverage in Europe and North America in the later half of the 20th century, especially as production techniques were developed to give it taste and consistency more closely resembling dairy milk. Along with similar vegetable-based "milks", like almond and rice milk, soy milk may be used as a substitute for dairy milk by individuals who are vegan or lactose intolerant. In China, the usual term doujiang (lit. "[soy]bean broth") is used for the traditional watery and beany beverage produced as a by-product of the production of tofu, whereas store-bought products designed to imitate the flavor and consistency of dairy milk are more often known as dounai ("[soy]bean milk"). In other countries, there are sometimes legal impediments to the equivalents of the name "soy milk". For example, in the European Union, "'Milk' means exclusively the normal mammary secretion obtained from one or more milkings without either addition thereto or extraction therefrom". Often, only cow's milk is allowed to be named "milk" on its packaging, and any other milks must state the name of the respective animal: "goat milk" or "sheep milk". In such jurisdictions, the manufacturers of plant milks typically label their products the equivalent of "soy beverage" or "soy drink". Soybeans originated in northeastern China and appear to have been domesticated around the 11th century BC, but its use in soups and beverages are only attested at much later dates. Soy gruel was first noted in the 3rd century BC,[a] soy "wine" in the 4th century, and a tofu broth (doufujiang) c. 1365 amid the collapse of the Mongol Yuan. As doujiang, this drink remains a common watery form of soy milk in China, usually prepared from fresh soybeans. Its popularity increased during the Qing dynasty, apparently due to the discovery that gently heating doujiang for at least 90 minutes hydrolyzed its raffinose and stachyose, oligosaccharides which can cause flatulence and digestive pain among lactose-intolerant adults. By the 18th century, it was popular enough that street vendors were hawking it; in the 19th, it was also common to take a cup to tofu shops to get hot, fresh doujiang for breakfast. 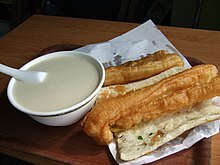 It was already often paired with youtiao, which was dipped into it. The process was industrialized in early Republican China. By 1929, two Shanghai factories were selling over 1000 bottles a day and another in Beijing was almost as productive itself. Following disruption from the Second World War and the Chinese Civil War, soy milk began to be marketed in soft drink-like fashion in Hong Kong, Singapore, and Japan in the 1950s. The first non-dairy milk—almond milk—was created in the Levant around the 13th century and had spread to England by the 14th. Soymilk was mentioned in various European letters from China beginning in the 17th century. "Soy milk" entered the English language (as "soy-bean milk") in an 1897 USDA report. Li Yuying established Caséo-Sojaïne, the first soy milk "dairy", in Colombes, France, in 1910; he received the first British and American patents for soy milk's manufacture in 1912 and 1913. J.A. Chard began production of "Soy Lac" in New York City, United States, in 1917. Harry W. Miller—an American businessman forced to relocate his factory from Shanghai owing to World War II—was similarly compelled by the USDA and the US dairy industry to use the term "Soya Lac" rather than "soy milk". John Harvey Kellogg had been working with what he called "soymilk" at his Battle Creek Sanitarium since 1930, but was similarly compelled to market his acidophilus-enriched beverage as "Soygal" when it began commercial production in 1942. A string of 40 court cases against Rich Products between 1949 and 1974 finally established that non-dairy "milks" and imitation dairy products were "a new and distinct food", rather than inferior and illegal knock-offs. Cornell researchers established the enzyme lipoxygenase's responsibility for soy milk's "beany" flavor in 1966; the same research established a process for reducing or eliminating it from commercial products. With Tetra Pak cartons extending its shelf-life, Hong Kong-based Vitasoy reintroduced soy milk to the US market in 1980 and brought it to 20 other countries within a few years. Alpro similarly began production in Belgium in 1980, quickly becoming Europe's leading producer. New production technology and techniques began to permit soy beverages with an appreciably more milk-like flavor and consistency in the mid-1980s. A cup (243 ml) serving of a generic unsweetened commercial nutrient-fortified brand of soy milk provides 80 calories from 4 g of carbohydrates (including 1 g of sugar), 4 g of fat and 7 g of protein. This processed soy milk contains appreciable levels of vitamin A, B vitamins, and vitamin D in a range of 10 to 45% of the Daily Value, with calcium and magnesium also in significant content. It has a glycemic index of 34±4. Soy milk flavor quality differs according to the cultivar of soybean used in its production. Even in China, the desirable sensory qualities are a mouthfeel (smooth but thick), color (off-white), and appearance (creamy) resembling milk. These traits—along with a pleasing aroma—are positively correlated with a soy milk's content of proteins, soluble solids, and oil. In the United States, testing suggests consumers prefer viscous soy milk with sweet aromatic flavors like vanilla and actively dislike the "beany" or "brothy" flavors resembling traditional doujiang. Soy milk is made from whole soybeans or full-fat soy flour. The dry beans are soaked in water for a minimum of three hours up to overnight depending on the temperature of the water. The rehydrated beans then undergo wet grinding with enough added water to give the desired solids content to the final product which has a protein content of 1–4%, depending on the method of production. The ratio of water to beans on a weight basis is 10:1 for traditional soy milk. The resulting slurry or purée is brought to a boil in order to improve its taste properties by heat inactivating soybean trypsin inhibitor, improve its flavor, and to sterilize the product. Heating at or near the boiling point is continued for a period of time, 15–20 minutes, followed by the removal of insoluble residues (soy pulp fiber) by filtration. Processing requires the use of an anti-foaming agent or natural defoamer during the boiling step. Bringing filtered soy milk to a boil avoids the problem of foaming. It is generally opaque, white or off-white in color, and approximately the same consistency as cow's milk. Quality attributes during preparation include germination time for the beans used, acidity, total protein and carbohydrates, phytic acid content, and viscosity. Soy milk soup with salt and vinegar, along with vegetables and wontons. Soy milk is a common beverage in East Asian cuisines. In Chinese cuisine, "sweet" soy milk is made by adding cane sugar or simple syrup. "Salty" or "savory" soy milk is often combined with chopped pickled mustard greens, dried shrimp, youtiao croutons, chopped spring onions, cilantro, pork floss, and/or shallots, along with vinegar, sesame oil, soy sauce, and/or chili oil. Both are traditional breakfast foods, served hot or cold depending on the season or personal preference. At breakfast, it is often accompanied by starchy carbohydrate-rich foods like mantou (a thick, fluffy kind of roll or bun), youtiao (deep-fried dough sticks), and shaobing (sesame flatbread). Japanese cuisine uses soy milk to make yuba and as an occasional base for nabemono. In Korean cuisine, soy milk is used as the broth for making kongguksu, a cold noodle soup eaten mostly in summer. In the west, soy milk is found in many vegan and vegetarian food products and can be used as a replacement for cow's milk in many recipes. Soy milk is also used in making imitation dairy products such as soy yogurt, soy cream, soy kefir and soy-based cheese analogues. Using soybeans to make milk instead of raising cows may be ecologically advantageous. Cows require much more energy in order to produce milk, since the farmer must feed the animal, which can consume up to 24 kilograms (53 lb) of food in dry matter basis and 90 to 180 litres (24 to 48 US gal) of water a day, producing an average of 40 kilograms (88 lb) of milk a day. Legumes, including the soybean plant, also replenish the nitrogen content of the soil in which they are grown. The cultivation of soybeans in South America is a cause of deforestation (specifically in the Amazon rainforest) and a range of other large-scale environmental harm. However, the majority of soybean cultivation worldwide, especially in South America where cattle farming is widespread, is intended for livestock fodder rather than soy milk production. ^ This is sometimes used to argue for an earlier date for soy milk itself. ^ a b Shurtleff & al. (2013), pp. 5 & 23–4. ^ a b Shurtleff & al. (2014), p. 9. ^ "Document 32013R1308: Regulation (EU) No 1308/2013 of the European Parliament and of the Council of 17 December 2013 Establishing a Common Organisation of the Markets in Agricultural Products...", EUR-Lex, Brussels: European Union, 20 December 2013 . ^ a b Shurtleff & al. (2014), p. 5. ^ Huang, 2008 & 51–2. ^ Shurtleff & al. (2014), p. 7. ^ Shurtleff & al. (2013), pp. 23–4. ^ Huang (2008), p. 52. ^ Shurtleff & al. (2013), p. 29. ^ Shurtleff & al. (2013), pp. 5 & 33. ^ a b c d e Shurtleff & al. (2013), p. 6. ^ Shurtleff & al. (2013), pp. 7–8. ^ The Forme of Cury, London, 1390 . ^ Shurtleff & al. (2013), p. 5. ^ Shurtleff & al. (2009), p. 174. ^ Shurtleff & al. (2004). ^ a b c Shurtleff & al. (2013), p. 8. ^ Shurtleff & al. (2013), pp. 8–9. ^ "Milk, whole, 3.25% milkfat, with added vitamin D" Archived 2018-03-16 at the Wayback Machine, United States Department of Agriculture, Agricultural Research Service. ^ a b c "Basic Report: 16222, Soymilk (All Flavors), Unsweetened, with Added Calcium, Vitamins A and D", USDA Food Composition Database, Washington: US Department of Agriculture, Agricultural Research Service, 2016 . ^ "Beverages, almond milk, unsweetened, shelf stable" Archived 2017-08-20 at the Wayback Machine, United States Department of Agriculture, Agricultural Research Service. ^ Atkinson & al. (2008). ^ Shi & al. (2015). ^ a b Ma & al. (2015). ^ Lawrence & al. (2016). ^ a b c d e f g Jiang, S.; Cai, W.; Xu, B. (2013). "Food quality improvement of soy milk made from short-time germinated soybeans". Foods (Basel, Switzerland). 2 (2): 198–212. doi:10.3390/foods2020198. PMC 5302266. PMID 28239109. ^ "Livestock's long shadow – Environmental issues and options; Chapter 2, Livestock in geographic transition" (PDF). United Nations, Food and Agriculture Organization, Rome. 2006. ^ a b "Soy is Everywhere". World Wildlife Fund. Retrieved 14 August 2015. ^ "Environmental & social impacts of soy". World Wildlife Fund. Retrieved 14 August 2015. Lawrence, S.E. ; et al. (2016), "Preference Mapping of Soymilk with Different U.S. Consumers", Journal of Food Science, Vol. 81 (No. 2): S463–76, doi:10.1111/1750-3841.13182, PMID 26677062 . Shurtleff, William; et al. (2014), History of Soybeans and Soyfoods in China and Taiwan and in Chinese Cookbooks, Restaurants, and Chinese Work with Soyfoods outside China, 1024 BCE to 2014 (PDF), Lafayette: Soyinfo Center . Wikimedia Commons has media related to Soy milk. This page was last edited on 5 April 2019, at 05:39 (UTC).